Fibre provider FX Networks has confirmed it will adopt the brand name of Vocus Communications, who acquired its business in July 2014. The two businesses combined have resulted in a major data network operator in New Zealand, and here's what you need to know. Vocus is an ASX listed (ASX:VOC) company with a market capitalisation of AUD$500m, providing connectivity solutions to businesses from SMEs up to some of the world’s largest content providers throughout Australia, New Zealand, Asia and the US. Vocus owns a fibre optic network in a number of major Australian capital cities, a number of data centres and a national and international network spanning Australia, New Zealand, Singapore, Hong Kong and the US. FX Networks is a major fibre provider servicing many of New Zealand’s major organisations including many government agencies, telco carriers, ISPs and enterprises. Its national network operates largely on its own 4,200km of fibre, and has been built for availability, performance and speed. Why is a single brand being adopted? •	To provide consistency - there are many customers who buy its services on both sides of the Tasman, as well as internationally. Dealing with one brand and one point of contact is logical. When is the proposed timing of the new branding? The intention is to roll out the change gradually over the next few months, early 2015. 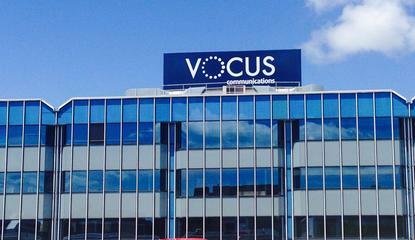 With Vocus and FX now as one, what does this mean for New Zealand businesses? Vocus’ international network is designed to connect New Zealand to the rest of the world - it includes direct capacity on the Southern Cross Cable into the US and Australia, as well as the SeaMeWe-3 cable (an important link between Australia and Asia), and into Hong Kong. Its highly engineered design offers a fully diverse international network with built in DDoS protection. For customers who do business on both sides of the ditch, or need reliable access into overseas-based cloud applications – such as Salesforce.com, Xero, Microsoft 365 and more - they now have access to a truly international network with all the performance gains, improved control and network visibility (and fewer headaches) that it brings. What additional services are now available with Vocus? In addition to its major network asset, Vocus has an extensive portfolio of highly available, highly connected data centres. These have direct connectivity into the Vocus’ international network. It also offers a direct connection into Amazon Web Services where customers can enjoy scalable, private, high speed access. Vocus is planning to introduce more dedicated direct connections into Cloud environments in the near future. Will any existing services (with FX) be affected? No – the company will continue to offer its full product suite, comprising Internet, WANs, Voice, Back up and Firewall security services. Will the current Network Operations Centre continue? In addition, Vocus will also continue to run its Sydney-based NOC, again with no change while the New Zealand management team remains the same.